The University of Colorado South Denver has announced the launch of an impressive new program, Journey to the Top | C-Suite Series, starting in November of this year. Kicking off this series is Andrew Rees, President and CEO of Niwot-based Crocs, Inc., the maker of one of the most iconic footwear silhouettes in the world. Rees will share personal stories from his two-plus decades in footwear and retail, including his pathway to Crocs, where he’s overseen the $1 billion brand’s transformation and growth efforts. The event will be held on Thursday, Nov. 29, from 5 - 7:30 p.m. It is free and open to the public with limited seating. With construction of bridges and other structures largely complete on the 2.5-mile Southeast Rail Extension in Lone Tree, the Regional Transportation District is entering a new phase where light rail trains can be tested on the line. Barring weather or scheduling delays, lines will be energized during the second week of November, with testing of the entire extension from Lincoln Station to RidgeGate Station taking place shortly thereafter. The testing process, referred to as “systems integrated testing,” evaluates technical and performance requirements for key elements of the line. As RTD Project Manager Andy Mutz explains, “Before we open the new extension for service, we test all the elements to verify that the construction produced a safe and reliable operating rail line.” Crews will measure track clearances, test train signals and test the electrical and communications systems. Once integration testing is completed, the Southeast Rail Extension will be turned over for training to RTD’s operations crews who will run the trains to gain familiarity with the new alignment prior to opening the line for revenue service. While this testing represents a significant step forward in the process to open the light rail line, a revenue service date has not yet been announced. Safety remains a guiding agency priority at all times. During train testing, the public is asked to abide by all safety signage, respect closures of railroad or at-grade crossings along the alignment, and not attempt to view testing by accessing construction areas at stations and various locations along the tracks. 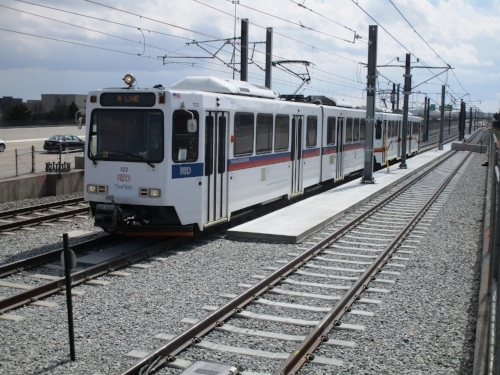 The Southeast Rail Extension project is part of RTD’s 2004 voter-approved FasTracks plan to expand rapid transit across the Denver metro region. The project will extend the Southeast Rail Line from Lincoln Station to Ridgegate Station. Systems and testing work is planned to take place on the Southeast Rail Extension through 2018, and the line is scheduled to open for service in 2019. The Regional Transportation District develops, operates and maintains a public transportation system that meets the transit needs of close to 3 million people within an eight-county service area in the Denver Metro region. The agency’s buses, rail lines, shuttles and additional services provide approximately 100 million annual passenger trips. For more information, visit rtd-denver.com, call 303-299-6000 and follow along on social media: facebook.com/RideRTD, @RideRTD on Twitter, @ridertd on Instagram and rideRTDco on YouTube. The City of Lone Tree is seeking the public’s feedback on updates proposed to the Lone Tree Comprehensive Plan, which provides the general direction of how the community should grow in the next 20 years and beyond. By City Charter, the Plan is evaluated every three years by City Council to determine if changes are warranted. The existing Plan was adopted by City Council in 2015. City staff encourages the public to review the proposed Lone Tree Comprehensive Plan and the Summary of Proposed Changes, and send comments, feedback or questions to Planning Manager Jennifer Drybread at jennifer.drybread@cityoflonetree.com by Nov. 21. The City of Lone Tree, along with the support of City of Centennial and City of Greenwood Village, is deploying innovative technology to improve traffic flow on the area’s busiest roads. “Traffic and congestion do not recognize municipal boundaries and neither do our residents. A regional solution is required and Lone Tree looks forward to employing innovative, smart technology in collaboration with our partners to provide real solutions for our communities,” said Lone Tree Mayor Jackie Millet. The Intelligent Transportation System — or ITS — an integrated communications system that connects to the City of Centennial’s fiber network and Traffic Operations Center is currently being implemented. Part of this implementation involves the installation of 64 closed-circuit cameras at high-traffic intersections and travel-time monitoring equipment on major corridors. These cameras are for real-time traffic monitoring, not surveillance. “Alleviating traffic congestion in conjunction with improving the safety and efficiency of our roadways are shared challenges among the cities of the south metro Denver area. Partnering with our neighboring cities on this pilot program will provide each of us with the integral data prior to investing additional resources in the appropriate technology for traffic management,” said Centennial Mayor Stephanie Piko. Recently the cities of Centennial, Greenwood Village and Lone Tree identified this pilot project to take a cross-jurisdictional approach to managing and reducing traffic congestion. Specifically, the cities are working to create a connected, data-driven, multi-jurisdictional traffic management plan for Yosemite Street between Lincoln Avenue and Belleview Avenue that promotes efficient and safe traffic flow through the installation of sensors at traffic signals. This is the first multi-jurisdictional partnership to enable adaptive signal technology. "This project speaks volumes about regional cooperation, demonstrates a coordinated approach to improving air quality, and positively impacts traffic flow," said Mayor Ron Rakowsky, Greenwood Village. A private sensor vendor, Blyncsy, has secured a grant to facilitate the installation of their sensors in Centennial and Lone Tree (Greenwood Village already has similar sensors in place) to monitor traffic and collect volumes, travel times, and delay (time spent waiting at a signal). The data collected will directly serve the City’s pilot project with Greenwood Village and Lone Tree to install adaptive signal technology on Yosemite Street. This data will fully describe the existing conditions on the corridor. After the adaptive technology is deployed and the software starts making tweaks to the signal timing, the entities can measure the effectiveness of the pilot project by comparing the before and after conditions. A successful pilot will prove emerging technology can be applied to traffic signals to benefit businesses, commuters, and residents alike, and will set a precedent for all future efforts our cities undertake. In an effort to expand mobility options and provide a multi-modal transportation network, the City of Lone Tree partnered with Uber in August 2017 to pilot a unique, on-demand micro transit program to provide the community free door-to-door rides within City limits. During its year-long pilot phase, Link On Demand provided more than 13,000 rides in Lone Tree. Every month, Link On Demand provides more than a thousand rides to major employers like Charles Schwab, Sky Ridge Medical Center and Park Meadows Retail Resort, as well as the library, recreation center and Lone Tree Arts Center. Link On Demand, which can only be accessed through the Uber app, is available daily. Anyone requesting a ride through the Uber app with a pick up location and destination within the City limits will see the free Link On Demand option. Although riders use the standard Uber app to book their rides, they are picked up in one of the City’s branded 12-passenger shuttles driven by professional drivers. In addition, these shuttles are wheelchair accessible, have bike racks and are kid-friendly. The higher capacity vehicle allows ride-sharing on a more significant scale to eliminate vehicle trips and reduce congestion. For more information, click here. Join the Lone Tree Police Department and Douglas County Sheriff’s Office for coffee and conversation on Wednesday, Oct. 3 from 10 a.m. to 11:30 a.m. at Starbucks located at The Vistas (8433 Park Meadows Center Dr.) at Park Meadows Retail Resort. This is a great opportunity to ask questions, voice concerns and get to know your officers and deputies better. Starting on Monday, Sept. 24, the City will begin removal and replacement of a storm sewer pipe at the intersection of Acres Green Drive and Park Meadows Drive. During this time, the northbound left-turn lane and northbound thru-lane on Acres Green Drive will be closed. One thru-lane on eastbound Park Meadows Drive will also be closed. Delays are expected when traveling through this area so please find alternate routes. Road work is expected to last three weeks. The City of Lone Tree has partnered with Bonfils Blood Center to host a blood drive on Monday, Oct. 8 from 9 a.m. to 2:30 p.m. at the City’s Municipal Building (9220 Kimmer Drive). For more information or to sign up to donate blood, call 303.363.2300 or click here and use site code 1353.